A large cadre of Cantonese speaking UNITE HERE Local 2 members, many with family members who are San Francisco SEIU home care workers, are joining NUHW’s efforts to qualify for a decertification election against SEIU this fall. Nearly half of SEIU’s 17,000 member bargaining unit is Cantonese speaking, and the influx of Local 2 members – who have deep roots in the city’s Asian-American community – is a major boost to NUHW’s campaign. Although Local 2 has a long relationship with NUHW’s leadership, and has expressed support for the new union since its January founding, its decision to commit significant resources to NUHW’s San Francisco campaign appears to have been incited by an SEIU flyer produced and distributed over three weeks ago. The flyer features a mug shot-type photo of Local 2’s elected President, Mike Casey, and was only discovered by the union last week. The caption above Casey’s photo states “Beware of the NUHW Liars,” directly attacking the integrity of one of San Francisco’s most respected and popular labor leaders. This attack on Casey has galvanized Local 2 members to defend their leader, escalating the already heated conflict between SEIU and UNITE HERE. If SEIU President Andy Stern is still optimistic that peace with UNITE HERE is at hand, he might consider visiting San Francisco. Such a trip would show him Cantonese and Russian speaking members of UNITE HERE Local 2 coming out in droves to help NUHW qualify for a decertification election among SEIU’s home health care local, and confirm that SEIU’s California problems in are escalating. SEIU has long maintained that UNITE HERE was secretly helping NUHW, as the leadership of the latter union has a long and deep relationship with the hotel workers union. 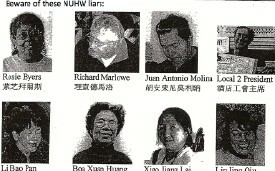 When fourteen hotels locked out Local 2 in 2006, the NUHW leadership went to Kaiser to ensure that hotel workers maintained health benefits, and used their clout in Sacramento to ensure that locked out hotel workers got unemployment funds. Such actions left Local 2 workers with a great sense of loyalty to NUHW leaders. But despite this loyalty, Local 2 did not publicly join NUHW’s fight when the former leadership of SEIU-UHW broke from SEIU last March to form a new union. Now, Local 2 is gearing up for a major contract campaign with the hotel industry. Negotiations begin next week, and Local 2 has tried its best to focus on what will be a tough battle with global hotel corporations in these economically tougher times. With emotions high as hotel workers prepare for an historic fight, SEIU chose this moment to distribute a flyer attacking Mike Casey’s integrity. It was like lighting a match to a pool of kerosene, and Local 2 workers – who have overwhelmingly voted for Casey in a series of union president elections – decided they could not sit back and allow SEIU to attack their leader, raid their union, and wage war against the NUHW leadership who backed Local 2’s 2006 campaign. Casey also noted that, before being removed as President of UNITE HERE, current SEIU Executive Vice-President Bruce Raynor is alleged to have shifted nearly $20 million from UNITE HERE’s strike fund to non-liquid accounts, just as the union’s national negotiations with the hotel industry are beginning and strike funds are most needed. Although AFSCME and other unions pledged to fully fund strike benefits for hotel workers to compensate for this transfer, Local 2 members are furious at SEIU’s backing Raynor’s action. SEIU is running an aggressive “Do Not Sign” campaign in San Francisco, seeking to prevent NUHW from obtaining the 7000 signatures needed to trigger a decertification election. NUHW has until the end of September to get these signatures, and SEIU has put great faith in the ability of Leon Chow, who stayed on with SEIU after the NUHW split to use his contacts in the city’s Chinese-American community. With a chance to put NUHW on the ropes by preventing decertification, who at SEIU had the brilliant idea of branding Local 2 President Mike Casey a “liar”? Logic dictated that SEIU do everything in its power to keep Local 2 happy at least through the end of August, when the signatures for decertification must be turned in. Instead, SEIU attacked a labor leader who has proved his popularity over a long period of time among rank and file Local 2 activists. Mike Casey is a key figure in San Francisco labor and political circles, and his union has deep roots among the electorate SEIU is trying to get not to sign. The great mystery here is how SEIU, which houses brilliant strategic leaders like Eliseo Medina and Stephen Lerner, continues to make mistake after mistake in California. In Fresno, UHW Trustee Dave Regan foolishly announced that a 52-48% victory would not be good enough, so when SEIU narrowly won it was widely seen as a defeat. Now, SEIU decides to publicly attack Mike Casey’s integrity so as to provoke San Francisco’s most activist and Cantonese-speaking union into making a major commitment of people power to NUHW’s decertification campaign. And SEIU distributed the flyer attacking Casey at the same time Andy Stern was telling his staff and the general public that his union was “standing down,” and that peace with UNITE HERE was imminent. This creates the impression that one hand of SEIU does not know what the other is doing. If SEIU does not realize that its attack on Local 2’s Casey will backfire, it will become clear by the end of September when the decertification petitions are submitted. The election between SEIU and NUHW for San Francisco’s 17,000 home health care workers could then occur as soon as October.